A Corpse's Nightmare by Phillip DePoy: Synopsis and Online Purchase Options. 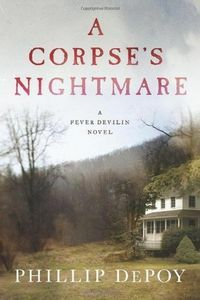 Synopsis (from the publisher): Fever Devilin is killed by an intruder. He doesn't stay dead — thanks to an emergency medical team — but he does slip into a months-long coma. When he comes out of it, there are two things he now knows: that he's been dreaming about the legendary Paris 20's café scene and that his would-be killer was after a blue tin box, containing a photo of what Fever believes to be an angel. As Fever struggles to recover, out there is a would-be killer who must be found … while there's still time.